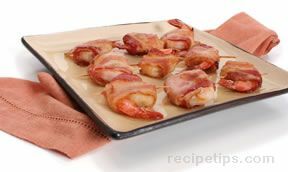 A tasty shrimp appetizer that is loaded with flavor. The lemon vinaigrette and cilantro enhance this recipe perfectly. 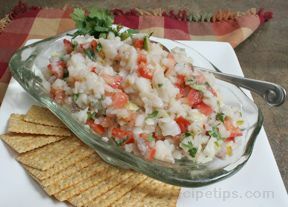 Place onion, tomatoes, and pepper in a large bowl. Add juice from lemons, salt and oil. Mix well. Rinse and chop cilantro and add to the bowl. Add shrimp to boiling water. 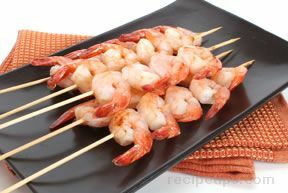 As soon as the shrimp turns pink take out of the pan and rinse in cold water. 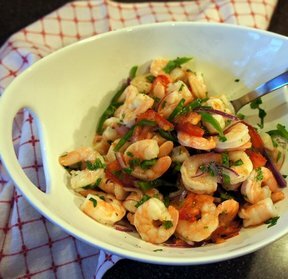 Place shrimp in bowl with vegetables. Stir to combine. "This was SO delicious! I thought it would need cocktail sauce with it, so I mixed some up, but nobody even touched it. The shrimp was flavored perfectly with everything else. The vegetables added crunch that was amazing. Definitely will make this again!"